Core strength has gotten a lot of attention recently. Many mistakenly think that the term only refers to a desire for “washboard abs.” But core strength is more than a cosmetic effort for a flat tummy. Core strength is important for being able to do just about every motion. One way to understand the role of core muscles is to picture these muscles as the middle link in a chain connecting your upper body and your lower body. Any movement that starts at the top or the bottom has to pass through this central group of muscles. There are three sheathes of muscles that make up the core. The upper abs, the side muscles and a deep layer of muscles that support your movements. If all or any part of these core muscles are weak or stiff, it affects movement throughout the whole body. Here are some of the ways your core muscle strength can affect your well-being, according to Harvard Health. You begin to engage your core muscles the minute you get out of bed as they help you sit and stand. They help you get dressed, pick up the paper from the front step and climb into the car to go to work. Daily movement like lifting, twisting or even standing still rely on the core muscles. Simply sitting as a desk requires core strength for good posture to avoid back pain. 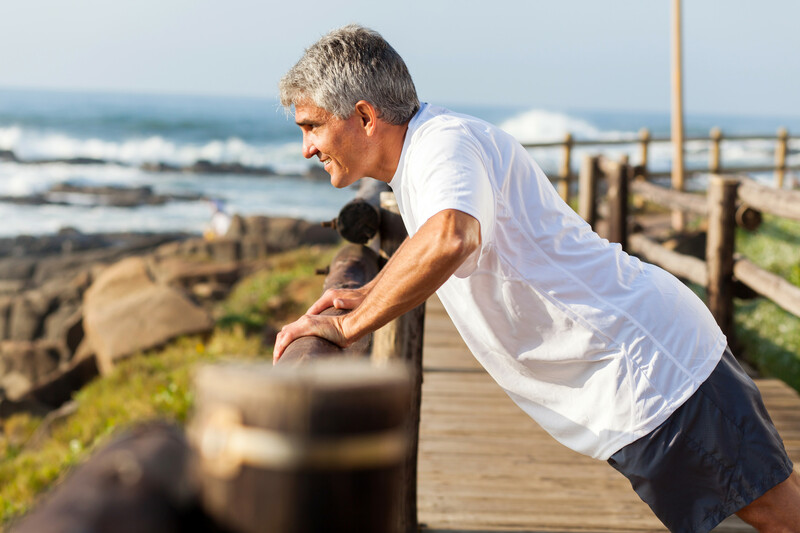 Leisure activities like golfing, swimming or biking also require strong core muscles. If these daily activities become painful, it is often weak core muscles that are the culprit. About four out of five Americans suffer from lower back pain at some point in life. This pain can often be prevented by giving attention to core strength. When the core muscles are resilient and well balanced, the back is properly supported and the chance of pain is reduced. A diagnosis of back pain is frequently treated with an order to strengthen core muscles through exercise. Having strong core muscles is integral to balance and stability. When your core muscles are in shape, it makes it easier to move in any direction, even when unexpected bumpy surfaces are in your path. They also help you quickly regain your balance when you are bumped or run into something. The risk of falling is reduced when the core muscles are ready for action. Good posture makes you look fit and confident but it is also important for your body’s many functions. When you hold the body in proper alignment, there is less wear and tear on your spine. Breathing is also easier because your lungs are in a proper position, not crunched beneath a bent spine. When posture is correct, the burden of your body weight is distributed more evenly instead of being born by the bones alone. If the core muscles are weak, slouching is more likely to occur. keeping the body from having proper alignment. Strong core muscles can help with proper digestion as they hold organs in place so they can perform properly. These central muscles actually form a protective shield around the spinal cord and internal organs and hold them in proper position while you are carrying out life’s activities. Keeping your core muscles strong helps your body operate more smoothly. It is not uncommon to suffer a loss of core strength following a medical event like surgery. When your movement is restricted, muscles lose strength. It can be challenging to regain that core strength but it is integral for a return to an active and productive lifestyle. This is why many people choose to recover at a short-term rehabilitation center where they have access to targeted rehabilitation equipment and experienced therapists who know exactly what to do to regain needed strength. Glenview Terrace, a Medicare five-star rated center for recovery, offers this high level of care. Understanding guests’ desire to quickly return to an active lifestyle, Glenview Terrace’s therapists provide customized one-on-one physical therapy seven days a week on state-of-the art equipment to speed the healing process and increase mobility. Occupational, speech, respiratory and intravenous therapies are also provided. An attentive nursing staff provides 24-hour care and ensures all of your doctor’s orders are met and can quickly react to any issues. Respiratory issues will be carefully addressed to reduce the chances of developing pneumonia. Glenview Terrace also provides a healthy diet at every meal filled with all of the protein, vitamins and iron needed for healing. A stay at Glenview Terrace is all about healing as quickly as possible in an elegant setting. Accommodations feature elegantly appointed suites and rooms with a walk-in shower in each bathroom. Thoughtful extras for short-term rehabilitation guests include morning coffee and newspaper delivery as well as concierge services. The beautifully landscaped grounds with a spacious patio and tranquil fountain also provide both an elegant and calming environment for a time of recovery.